Background: Loss of hand function has a detrimental impact on the physical and psychosocial functioning of those with hand burns. Of prime importance is the maintenance of range of movement (ROM). Subsequently, an ideal hand dressing needs to allow for full ROM, be comfortable, and facilitate healing. However, hand burns present complex challenges for burn clinicians with the dressing of choice remaining controversial. 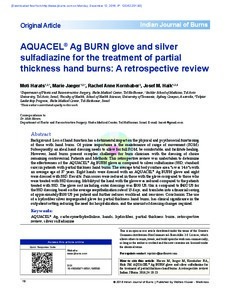 Patients and Methods: This retrospective review was undertaken to determine the effectiveness of the AQUACEL® Ag BURN glove as compared to silver sulfadiazine (SSD; standard care) in patients with partial thickness hand burns. The average total body surface area % was 14.6% with an average age of 37 years. Eight hands were dressed with an AQUACEL® Ag BURN glove and eight were dressed with SSD. Results: Pain scores were reduced in those with the glove compared to those who were treated with SSD dressing. Mobility of the hand with the glove was reduced compared to the patients treated with SSD. The glove cost including outer dressings was $330 US, this is compared to $432 US for the SSD dressing based on the average reepithelization rate of 15 days, and translates into a financial saving of approximately $100 US per patient and further reduces workload and resources. Conclusion: The use of a hydrofiber silver impregnated glove for partial thickness hand burns, has clinical significance in the outpatient setting reducing the need for hospitalization, and the amount of dressing changes required.